Use the right lacing style! 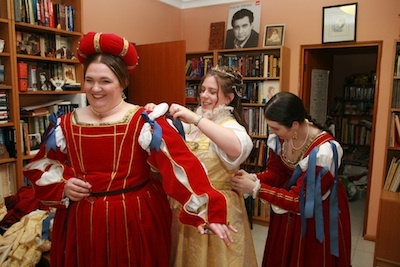 When you think of historical costume, it's likely you'll think of lacing clothes closed. The art of closing our clothes, and of holding them together, has changed and developed over centuries. And it's not just corsets and dresses that were closed with this method. Back when buttons were incredibly expensive items for people to own, lacing was used to hold on sleeves, to hold up pants or "hose", and even to hold your buttons in place so that you could switch them from garment to garment! Lacing is also about the only way you can get a tight-fitting or supportive garment to hold firm when you are wearing it. The alternatives are buttons or hooks pinging off in every direction! It's very important to the look of the garment you are making, for you to use the right type of lacing for the period it comes from. It was very rare for people in the 15th and 16th centuries to use "crossed lacing" - which is the style that nearly everyone thinks of when they first start making costume with laced closures. In these two centuries, there are two fairly typical styles of lacing used: "ladder lacing" and "spiral lacing". And then there was the rather odd version of crossed lacing I found in a 15th Century Venetian painting by Ghirlandaio only recently - I call it "crossed-and-tied lacing". It isn't really until the 17th and 18th Century that your familiar crossed lacing starts to appear, and then you have other variations used for closing later corsetry, where the lacing was tightened from the middle, or even "double-laced" to cinch the waist even tighter! From the earliest times, lacing was used to hold up your hose (pants). It could be used to attach them to your braies (underpants), to a belt (martingale), or to an underjacket often called a "pourpoint". It was also used to tie your armour on over a padded jacket. You could also use bows to tie on detachable sleeves that could be removed for cooling off, or changed for a different look. Normally we think of the type of bow used to tie our shoelaces or a gift. This is not a very stable type of bow, and I'm going to show you how to tie versions which are much more stable/ less slippery, and less-likely to get caught up in each other if you have to untie them in a hurry. Before your head explodes with all this information, I've got to suggest the most important thing when designing a new historical garment: Look very closely at the pictures and painting you are using as references before you stitch on lacing rings, or go punching holes in your masterpiece! If you can't work out what they've used to hold up their clothes (! ), then hopefully the following pages will help you find something that looks similar. I've tried to use examples from real paintings from the periods I am talking about, as well as diagrams to show you how it is done. None of you are fools. I wouldn't dream of suggesting it! But there is one final thing many people forget when they're planning their lacing for historical clothing. Make sure you read my articles on lacing holes and stabilisation before you get too stuck in as well. They may save you a lot of grief and wondering why something didn't work out the first time! Try Crossed-and-Tied Lacing for something different. Spiral Lacing is very versatile.